Fanuc SP-8 ext.fin AC spindle drive. GE Fanuc Spindle Servo A06B-6055-H208 unit are available for exchange, surplus rebuild refurbishment and full repairs are also available if time is not critical. CNC’s has no exchange stock of A06B-6055-H208 digital spindle amplifiers DGTL ACSP control unit, full testing and fault diagnosis for external cooling heat sink high running temperature tested with GE Fanuc series controls and driving model 8, 15P external ventilation AC spindle motors with extensive full-load testing at the maximum motor speed. Used surplus is stock dependent though ex-stock (surplus to exchange requirements) is presently available to be shipped today. Regarding repair of the A06B-6055-H208 GE Fanuc spindles, CNC can refurbish and fully test these spindle drives and ship them back to you within 24-48 hours of receipt. Ex-Stock Surplus is available exchange ! call CNC for prices ! Used with Fanuc CNC series Mills and Lathes with systems 10 and 11, 15, 0M 0T Series. The group has over 22 years experience cleaning, diagnosing, repairing and testing GE Fanuc digital spindle drives, and fully confident in our used ex-stock items either as exchange or surplus. 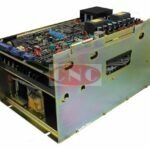 The Price for A06B-6055-H208 drive unit is second to none, for either service exchange with a core credit exchange policy, used outright surplus with an extended warranty, repair of the complete drive including the control boards A20B-1001-0120. And full comprehensive testing. All A06B-6055-H208 AC spindle units are tested on Fanuc analogue controls and Fanuc AC spindle motor.